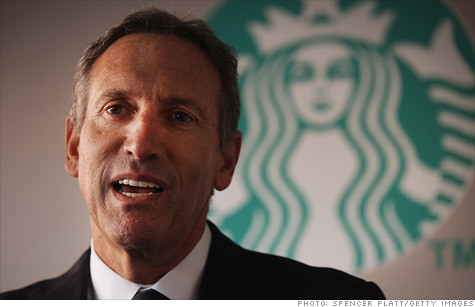 CEO Howard Schultz made $65 million in 2011. NEW YORK (CNNMoney) -- Starbucks chief executive officer Howard Schultz was paid more than $65 million in fiscal year 2011, including salary, bonuses and stock options. That places Schultz in the exclusive club of executives earning at least $50 million per year. Schultz earned a base pay of $1.4 million, a bonus of $2.9 million, and a "long-term incentive" of $12 million, according to Starbucks' proxy statement filed with Securities and Exchange Commission on Thursday. That "direct compensation" totals nearly $16.4 million. In addition, Starbucks said that Schultz received a retention bonus of $12 million and exercised stock options worth $36.8 million. So altogether, the CEO earned more than $65.2 million in 2011. In the proxy statement, the company praised Schultz for his "exceptional performance and his leadership." Starbucks (SBUX, Fortune 500) filed the statement Thursday, the same day that the company filed its returns for its first quarter of fiscal year 2012, covering the 13 weeks that ended Jan. 1. The company said that total net revenues jumped 16% to a record high of $3.4 billion. Same-store sales around the world rose 9%. Net earnings rose 10% to $382 million. Earnings per share rose 11% to 50 cents, another figure that the company identified as a record. This announcement comes just days after Starbucks announced that it would offer alcoholic drinks - beer and wine - at some locations in Atlanta and Southern California later this year. Starbucks already serves beer and wine at some of its Chicago locations. Starbucks also announced this month that it would raise prices for select drinks at some locations in the Northeast and the Sunbelt, but not California or Southern Florida.